Is King George County missing an opportunity? And if so, is it too late to do something about it? When it comes to tourism, I think the answers to those two questions are “yes” and “no.” We can do something about it. Let me explain. There’s no question that economic development is critical to the growth and fiscal health of the county. 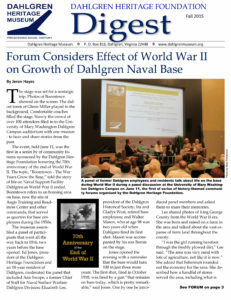 That’s why those of us who have worked to open the Dahlgren Heritage Museum are so excited about the support our high-profile facility at the foot of the Nice Bridge can give to economic development through tourism. The Virginia Tourism Corporation (VTC), recently reported that tourism is playing an increasingly important part in meeting economic-growth objectives statewide. How? Another report, this one prepared by the Research Department of the U.S. Travel Association (USTA) last August, shows that tourism is one of the top five sources of jobs in the Commonwealth and is continuing to increase. The report also notes that tourism employment is relatively recession-proof and adds to economic diversity. Most importantly, the forecast for the national tourism industry is rosy. The VTC report reminds us that’s also true for Virginia. Indeed, statewide tourism-related expenditures are expected to grow by 5.6 percent per year. The top spending categories for travelers in Virginia are foodservices, auto transportation, and lodging. Domestic travelers spent nearly $16 billion in Virginia in these categories in 2012 and more than $21 billion total on tourism. A benefit of the tourism-related expenditures, beyond employment and the associated payroll, is the tax revenue that is generated. The USTA report estimates that $2.7 billion was generated by domestic travel in 2012; an increase of 3.3 percent over the previous year. More than half of this tax revenue went to the state and local governments with nearly 21 percent going to local governments. This sounds pretty good for the Commonwealth in general and for the primary tourist areas in Northern Virginia and Hampton Roads. In fact it is. Around 40 percent of the tourism-related expenditures, employment, and tax revenues are generated in only five localities in 2012. What does – or can – it mean for a county like King George? We have the assets that attract tourism – recreational areas and historic sites and access to an increasing number of travelers. The state of Maryland, for example, estimates that 7 million cars cross the Harry W. Nice Bridge every year and that number is increasing. However, the USTA data for 2012 show that King George isn’t taking advantage of its opportunities. The County ranked 96th of 134 counties and independent cities in Virginia in tourism-related expenditures. Indeed, our county ranked below its nearest neighbors in the Fredericksburg area and in the Northern Neck in tourism related expenditures, employment, and local tax revenue. What can be done to improve the situation? Just as with most things, it takes work and investment. King George needs to advertise its attractions and fully participate in regional and state tourism groups. Most importantly, it can begin by investing some of the tax revenue generated by tourism-related activities in the activities and attractions that will bring tourists to the county. A good first step would be to continue to build a close-knit and collaborative network of county tourism-related businesses and county economic development leaders. We’re off to a good start, with regular, county-sponsored briefings for that group. But it needs to be more formalized, not just as an education outlet for tourism attractions but also as an advisory council to county leaders, including the Board of Supervisors. So, is King George missing an opportunity? Speaking as one who spends a considerable amount of time at the Dahlgren Heritage Museum, with a front-row look at those 7 million cars a year, I think that we probably are. The good news is that we don’t have to and it’s not too late to do something about it. Dr. Gates is the Vice President of the Dahlgren Heritage Foundation, which supports and operates the Dahlgren Heritage Museum, now open every third Saturday afternoon of the month. For updates on the museum, go to dahlgrenmuseum.org. Originally published in the King George Journal on April 2, 2014. Click to view.